Supervising your Children with puppies and Puppy Training! What are the differences in Championships with different clubs/venues? IABCA, ICE: when you see "Int'l or Nat'l Champion" that means the dog could have gotten a championship in just 3 or 4 shows and never has to beat another dog to get it. The dog is judged against the breed standard not the other dogs. An ASDR champion is earned by accumulating points and can be achieved by being a participant (although that would be a lot of shows). They earn points up to 3rd place in just their age class then go on and get more points as they get Winners, Best of Winners, Best of Opposite and/or Best Of Breed. If you win in the ring you will accumulate those points faster though. They have different levels of champions, so the higher the level the more points you would have to accumulate. A MASCA Championship is just like ASCA or AKC shows, you have to get 15 points with a major as part of that (meaning you have to get Best of Winners, Best of Opposite or Best of Breed for that major). You can achieve points for Winner's but you will not get a major and you can only count the non-champion dogs in the show (not including yourself). For Grand Championship you need 50 points (starting over after that 15 pts for championship) with 3 Majors which ONLY include Best Of Opposite or Best of Breed. We achieved Hall of Fame Breeder status in September 2017. We needed 12 of this combination: Conformation (3), Herding (3) and high level Performance (3) plus 3 more of any of those or a combination. We have raised 6 champions and 4 grand champions with others sired by our stud dogs that have gotten their championships. Our dogs have 6 herding titles (so far) and quite a few high level performance titles. 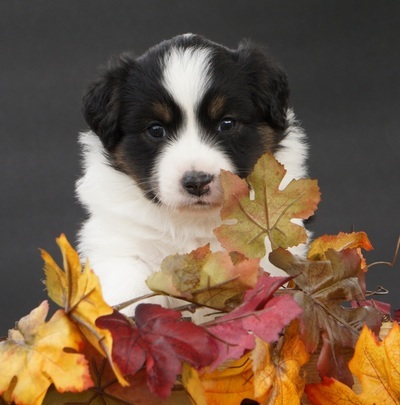 We know there will be many more in the future especially since we use the personality evaluations to be sure the performance pups get in to performance homes. IMASC: That club takes the copy of your MASCA Championship and makes the dog an IMASC champion. They have no show program at this time, they work on the merits of other clubs. 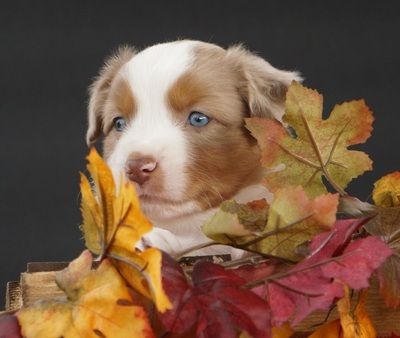 As you can see from this list, MASCA championships have the most integrity of all the Mini Aussie clubs and we are proud to get as many of our dogs championships or grands as possible. So when you see Champion on a dog you are considering purchasing from or breeding to be sure to find out what venue it got the championship from. By learning basic body language, dog bites can be prevented! Always Supervise Dogs And Kids! 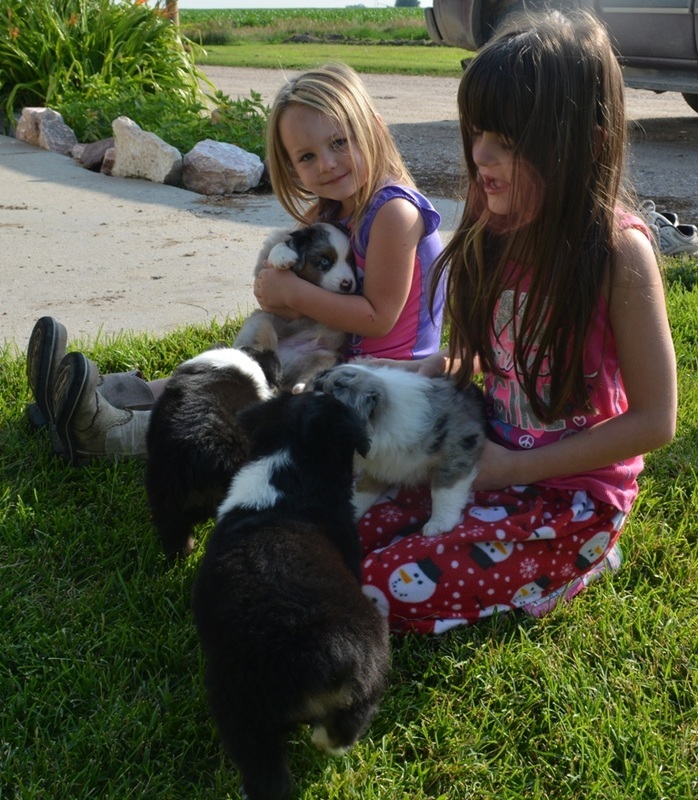 It's sound advice given frequently: Supervise your dogs and kids while they are together. Breeders warn parents, "Don't leave the dog alone with children, no matter how friendly the breed." Veterinarians advise, "Never leave a dog and a child in the same room together." Dog trainers explain, "All dogs can bite so supervise your dog when you have children over." Everyone knows the drill. So why doesn't it work? Why are there an estimated 800,000 Americans seeking medical attention for dog bites each year, with over half of these injuries to children ages 5-9? The bites are not a result of negligent parents leaving Fido to care for the baby while mom does household chores, oblivious to the needs of her children. In fact, I've consulted on hundreds of dog bite cases and 95% of the time the parent was standing within 3 feet of the child watching both child and dog when the child was bitten. Parents are supervising. The problem is not lack of supervision. The problem is no one has taught parents what they should be watching. Watch for loose canine body language. Good dog body language is loose, relaxed, and wiggly. 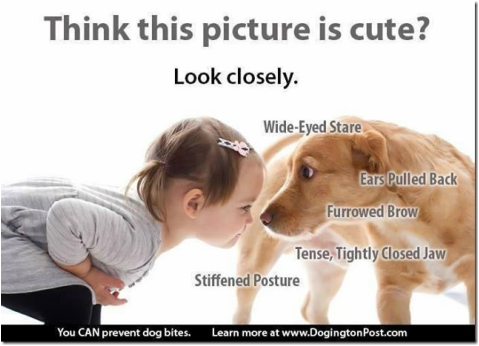 Look for curves in your dog's body when he is around a child. Stiffening and freezing in a dog are not good. If you see your dog tighten his body, or if he moves from panting to holding his breath (he stops panting), you should intervene. These are early signs that your dog is not comfortable. Watch for inappropriate human behavior. 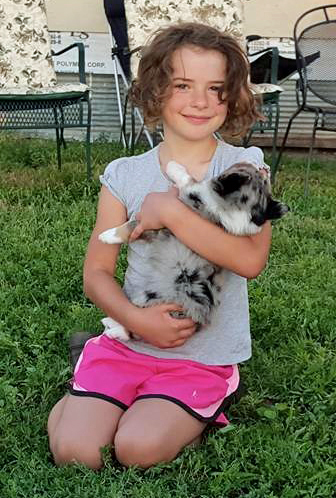 Intervene if your child climbs on or attempts to ride your dog. Intervene if your child pulls the ears, yanks the tail, lifts the jowls or otherwise pokes and prods the dog. Don't marvel that your dog has the patience of Job if he is willing to tolerate these antics. And please don't videotape it for YouTube! Be thankful your dog has good bite inhibition and intervene before it's too late. Half-moon eye – this means you can see the whites of your outer edges of your dog's eyes. Watch for avoidance behaviors. If your dog moves away from a child, intervene to prevent the child from following the dog. A dog that chooses to move away is making a great choice. He's saying, "I don't really want to be bothered, so I'll go away." However, when you fail to support his great choice and allow your child to continue to follow him, it's likely the dog's next choice will be, "Since I can't get away, I'll growl or snap at this kid to get the child to move away." Please don't cause your dog to make that choice. Listen for growling. I can't believe how many times I've heard parents say, "Oh, he growled all the time but we never thought he would bite." Dog behavior, including aggression, is on a continuum. For dogs, growling is an early warning sign of aggression. Heed it. If growling doesn't work, the dog may escalate to snapping or biting. Growling is a clue that you should intervene between the dog and the child. * Talk to your children about your pet's "body language." They give warning signs that mean, "leave me alone"
* Teach your children and puppy to respect each other and 'play nice"
* Train your dog to respond to the word "stop". Teach your kids to use that word (instead of screaming or running away) if the dog gets overexcited. * Don't let your pet play with your child's toys... or vice versa. 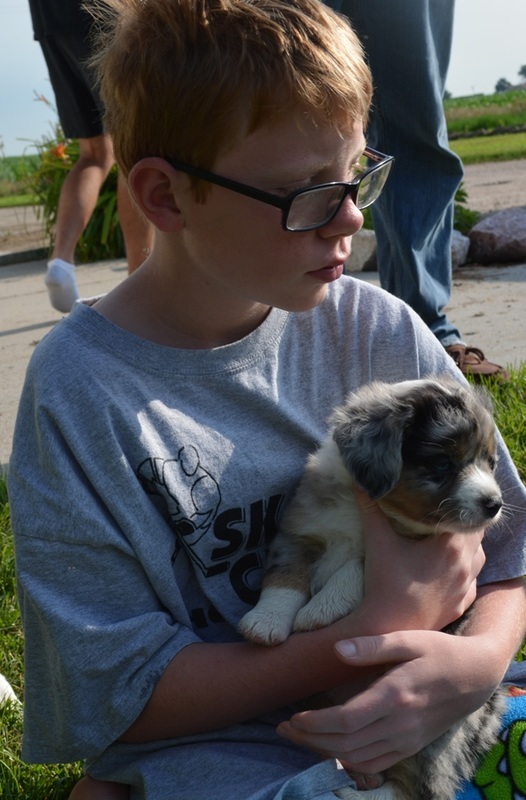 * If your children are old enough, let them take some responsibility for caring for the puppy. Set reasonable consequences if they neglect their duties. ONE: Your dog is a dog; not a person in a fuzzy dog suit. Even though he is a member of your family he will act like a dog. TWO: Bad behavior isn’t personally directed at you so don’t take it personally. Treat bad behavior as a mistake and try to prevent it from happening again. THREE: Limit your dog’s freedom in the house. He should not have free run of the house until he’s two to three years of age – no younger! Until then he’s not mentally mature enough to handle the responsibility. FOUR: Limit your dog’s freedom off leash outside of a fenced yard for the same reason. SIX: Teach your dog that ‘good’ is a magic word. Use it whenever your dog does something right, smile as you say it, and follow it with praise, petting or a treat. SEVEN: Timing is very important. Praise your dog the instant he does something right and interrupt him the moment he makes a mistake. EIGHT: Decide on rules for the house, the yard and out in public and enforce them consistently. Make sure everyone else in the house does so, too. NINE: Make sure your dog gets plenty of exercise every day. A walk is not enough exercise for a young, healthy dog. A run, a jog, a vigorous game of Frisbee is better. A tired dog is a happy dog! TEN: Remember, you are taking the place of your dog’s parents so act like it. You are his leader, not his best buddy! 3. Manage the situation so the undesired behavior becomes non reinforcing or impossible. Why is the puppy doing it? Because it's natural to chase and bite moving things. So step one, if the puppy pounces, STOP MOVING. 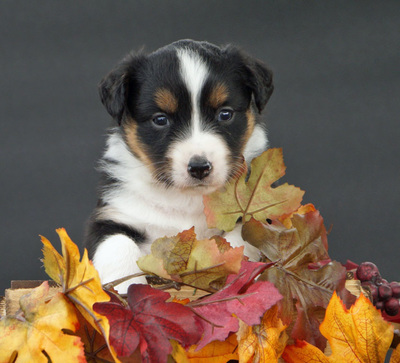 As soon as the puppy pauses, click and treat -- reinforce the pause in activity. Start walking... stop the moment his teeth touch your ankles or clothes. Never again take a step while the puppy is biting you. In this method, the dog has learned walking with mom is fun -- more fun than biting ankles and pant legs.